Kismet Rubber Products has earned the reputation as a leading extruder of rubber and silicone parts for industrial applications. Our attention to detail and commitment to excellence for every project, coupled with our experience and knowledge of the industries we serve, ensure that your extruded product will meet or exceed your expectations. For over 60 years, Kismet has provided high quality, high performance extruded parts to the electronics, aerospace, healthcare, construction, transportation, food processing, marine, appliance, and power generation industries. 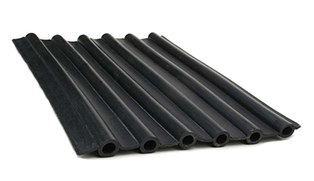 Standard and specialty rubber compounds and formulations, including EPDM, Neoprene® 1, SBR, nitrile, natural rubber, FKM (Viton®), fluoroelastomers, silicone, thermoplastic rubber (TPE), and flexible PVC. Materials available in commercial and specification grades to meet industry and regulatory standards, including Mil Spec, ASTM [D-2000], SAE, FDA, UL, AMS, FMVSS, and industry-specific standards for smoke, flame, and toxicity. Value-added services, including in-line marking, notching, hole punching, slitting, metal/rubber and plastic/rubber parts assembly.